Cartoons & Caricatures' Lee P. Sauer, who was named top weekly political cartoonist by the Hoosier State Press Association in 2000 and 2001, was one of three members of the online group indianacartoonists.com who spoke to visitors of the Wells County Public Library in Bluffton, IN, on Thursday, April 15. Dave Sattler, political cartoonist for the LaFayette (IN) Journal and Courier, and Irene Joslin, political cartoonist for the Brown County (IN) Democrat, showed examples of their work and explained the contexts behind the messages. Sauer spoke on the history of political cartooning. About 50 people attended the presentation, which coincided with the arrival at the library of the Indiana Historical Society’s traveling exhibit, "Politics." 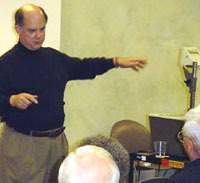 SATTLERIZED—Dave Sattler plays to the crowd as he explains one of his cartoons using an overhead projector. POPULAR POLITICO—Irene Joslin talks with a fan following the presentation. HISTORY LESSON—Lee P. Sauer began his discussion of the history of political cartooning with Ben Franklin’s famous "Join, or Die," cartoon, which appeared in 1754.